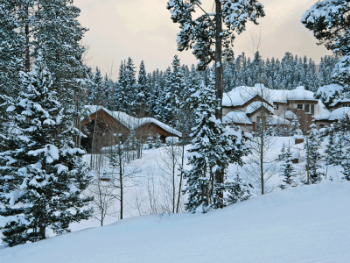 High on the ski hill side of Breckenridge, near the place where Four O’clock ski run leaves the national forest, is a newer subdivision of high-end, single family homes called Trappers Glen. Homeowners here have a short run home from Peak 8 – and an easy way onto the mountain in the morning either down Snowflake or 4 o’clock runs to the Snowflake lift. Four O’clock Run (4 o’clock ski trail) is the long neighborhood ski run that covers two miles between the base of Peak 8 and downtown Breckenridge. Trappers Glen homes for sale take advantage of a quiet and secluded location that is well-connected to downtown Breckenridge by Four O'Clock Road. Find out more about this exclusive subdivision, or start your search with the active Trapper Glen real estate listings below. It's a five-minute drive to the center of town from up here in Trappers Glen where Four O’clock road deadends and ski runs surround the homes. The neighborhood feels quiet and private, even today, because of the large number of trees salvaged during construction, and will become even more so because of new landscaping required by strict Breckenridge zoning regulations. The views to the east and Baldy Mountain are phenomenal from Trappers Glen, and the ski trails surrounding the neighborhood will lead more than just the eye into the natural lands of the national forest. In summer they become hiking trails. Adjoining the home sites toward the southeast are more than seven acres of open space preserved for wetlands around Sawmill Creek. When the first home was built up by the base of the ski area in 1969, Ski Hill Road was a dirt road, and it would have been a steep climb home from town. But today, the close-in stuff has been well developed, ski and hiking trails have been maintained, and the road has been greatly and improved – paved, widened and flattened. 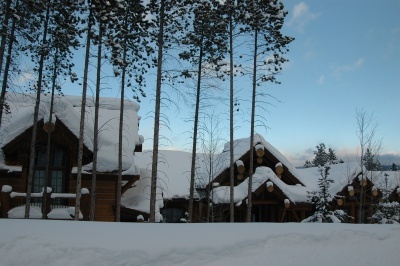 Trappers Glen is now less than a 5-minute drive from town, and minutes from the base of the ski area – by car or foot and is surrounded by newer, but similarly high-end subdivisions like Timber Trails, Four O’clock and Boulder Ridge. Size: 4192 sq. ft. to 9904 sq. ft.
From the center of Breckenridge (main stop light on Ski Hill Road) drive south on Park Avenue to Four O’clock Road. Continue on this road (about 1 mile) until the very end. The high-end homes on either side of this road are Trappers Glen. An expert from the Breckenridge Associates real estate team is waiting to talk to you! Send us a message to discuss your real estate opportunities in Trappers Glen, or any other Breck community.